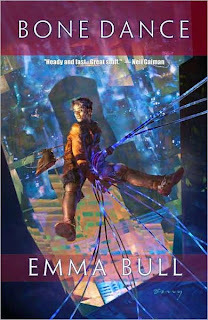 When it was first published Emma Bull’s Bone Dance was nominated for the Hugo, Nebula, and World Fantasy Awards. Given that each nomination came from a different pool of readers, it’s an impressive achievement. There is some overlap, sure, but the Nebula is peer voted, the Hugos are fan voted, and World Fantasy is a juried award. Which is to say: Holy crap! Which is to say that years later, Bone Dance has a lot to live up to. Bone Dance is the story of, and is narrated by a character named Sparrow. Sparrow’s gender is not made clear in the first half of the novel, and I’m not going to write much about what happens in the second half, but what I am willing to say is that I initially read Sparrow as being female. I suspect the cover art has something to do with this, but it is also the impression I got from the text. Sparrow is…well, Sparrow is a collector and a seller. Sparrow makes deals and finds rare artifacts from the past – movies, CD’s, and the related. See, this is a post apocalyptic world where the city is called The City and it runs on barter. That’s what Sparrow does, [she] makes finds stuff and makes the Deal. Sparrow’s problem, one of them anyway, is that occasionally [she] blacks out and when [she] wakes [she] is someplace else – sometimes an unknown part of the city, with no recollection of was done or said or why. The first half of the novel (or so) sets all this up, gets Sparrow into some trouble with very dangerous people, and fairly well keeps the reader in the dark as to what is happening. The second half of the novel reveals the background to what was going on and some of the history of how the apocalypse happened that we are now in the post of. Emma Bull also challenges everything we thought we knew about this world and more specifically about Sparrow. Things ain’t what they seem. Gender isn’t inherently essential to Bone Dance, but since gender is part of identity, I’m being purposefully vague as to what is going on. Besides, Bull herself is vague on the details in the first half of the novel. My gender choice to describe Sparrow is entirely tied into how I read the character for the first half of the novel. Of course, just by pointing this out I call attention to it that might not have otherwise been there. If I don’t mention gender do you think about it? Switching gears: What I found exceptionally cool is that The City is Minneapolis. Emma Bull never explicitly states that, but the first hint was when the Nicollet Mall was referenced. I just made an assumption at that point. Then I-394. I’m sure if I were more familiar with Minneapolis I would have picked up a lot more early on, but alas, I am not. But the locks and dams, I-94 to Cedar, and later the names of surrounding suburbs pretty well nails The City as Minneapolis. Not that this really matters. It doesn’t. The City *could* be any city. I just like seeing SFF set in Minnesota. Bone Dance is subtitled “A Fantasy for Technophiles”, which is to suggest that while there are strong fantasy elements (things that don’t and can’t exist), it is set in a SF milieu. Post apocalyptic, lots of broken down technology. That sort of thing. It’s post apocalyptic urban fantasy where urban fantasy simply means fantasy set in an urban environment (like War for the Oaks) instead of paranormal romance. There’s something else I want to bring up – the chapters of Bone Dance are built around cards of the tarot, and there are three definitions given on each chapter beginning. I very much believe this is important and that Emma Bull didn’t waste her time putting that information into the book. My confession, though, is that it didn’t make a lick of sense to me. Not as I was reading the book and not going back and looking at some of that those chapter headings. I can’t make head nor tail of them. I suspect that this will enhance the reading experience of some, but it was a distraction for me. The first chapters of the novel did not completely sell me on the forthcoming narrative. But once Emma Bull drew me deeper into the central mystery of what is happening to Sparrow and to the core conflict of Bone Dance, then I was hooked. I don’t know if Bone Dance was the best novel the year it was published or if it was truly stronger than other novels not nominated for the Hugo, Nebula, and World Fantasy Awards. What I do know is that Emma Bull can tell a good story and this is a stronger novel than her excellent debut War for the Oaks, and that Bull has improved with each of the three novels I have read (in publication order, mind you). Emma Bull is a major talent and Bone Dance is a strong novel that is not without its flaws (it can get a bit confusing, and even as a narrator Sparrow is not entirely a sympathetic character…which isn’t necessarily a flaw), but as a whole, Bone Dance is a solid and mostly impressive novel. It’s worth the read. Reading copy provided by Tor Books.